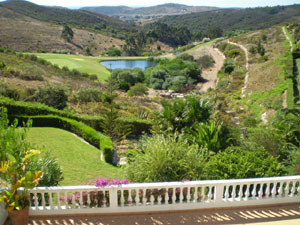 Location:- This outstanding luxury villa situated on the prestigious Parque da Floresta Golf & Leisure Resort enjoys superb views over the golf course with the Atlantic ocean in the distance. 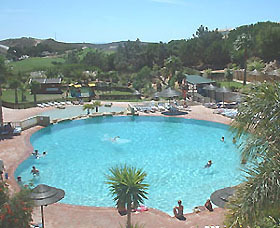 The resort itself is near the village of Budens and borders the nature reserve of Costa Vincentina. The scenic west coast of Portugal with its stunning rugged scenery is a short drive away and has some of the best beaches in the world with spectacular scenery and a variety of birds and flora. The nearest beaches to the resort are Boca do Rio, beautiful but with no facilities and Salema, 5 minutes drive away, which is busy in the summer but boasts a safe, sandy beach with plenty of beach bars and restaurants. Sliding mosquito nets have been fitted to every patio door and every window. 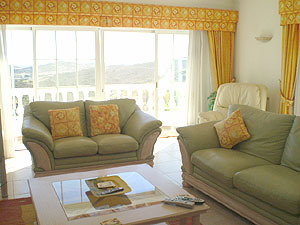 The Living room:- is tastefully furnished with good quality furniture, comfortable leather sofas and chairs. 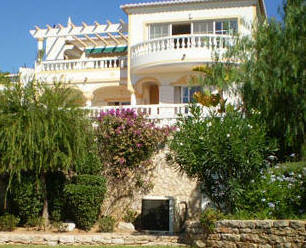 There are two sets of patio doors leading out onto the upper terrace which overlooks the pool and garden. There is digital satellite television with "free to air" channels, a DVD, CD and stereo music centre for the entertainment of guests. A log burner provides heat for winter lets. 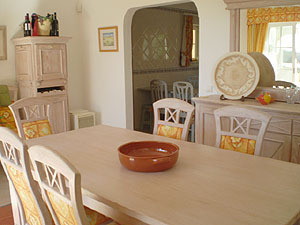 A step down from the living room brings you to the dining area which has a table and chairs for 8 people with matching sideboard and drinks cabinet. A further set of patio doors lead to the upper terrace which is equipped with table and chairs for outside dining on warm summer evenings. An electric canopy provides shade and there is a built in charcoal barbecue and sink. Steps lead down to the pool terrace below. 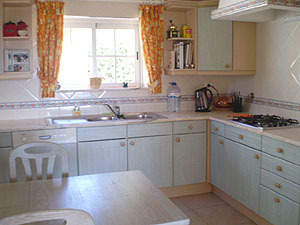 The kitchen is fully fitted with green stripped pine units and has an electric double oven, gas hob, microwave, dishwasher, fridge freezer, toaster, coffee machine, table and 4 chairs. The utility room is off the kitchen and contains the washing machine, a sink and a clothes airer. 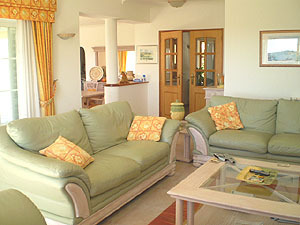 The villa has three bedrooms all with en-suite facilities and all with patio doors leading to the lower terrace. All have ample wardrobe space and a sliding mosquito net over one patio door. There is also a separate door out onto the lower terrace. 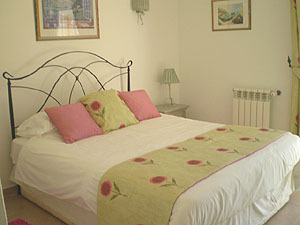 Bedroom 1:- king size double bed, mirrored wardrobes and a full bathroom containing a jacuzzi bath with integral shower. 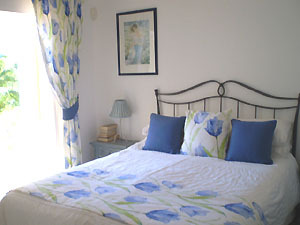 Bedroom 2:- king size double bed, mirrored wardrobes and en-suite shower room. Bedroom 3:- king size double bed, mirrored wardrobes and en-suite shower room. Please Note:- one of the king size doubles can be split into 2 singles. 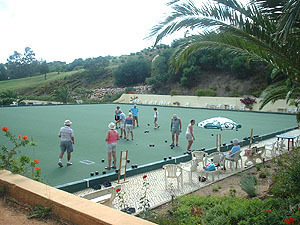 The garden at Casa Los Bols is filled with a wide variety of flowers, mature trees and grassed areas, ideal for relaxation and for children to play in complete safety. 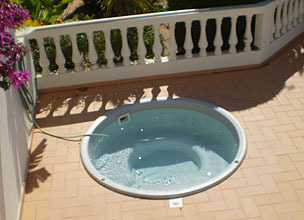 The large rectangular pool can be heated, ( at extra cost) and there is a small round jacuzzi pool to one side. Sun loungers and umbrellas are provided. 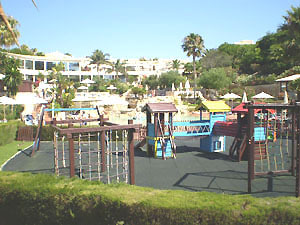 Rental Prices and Booking : - Prices are per week and are shown in sterling. 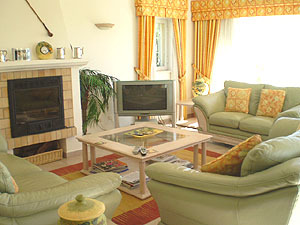 Maid service once a week and a mid term clean and linen change for two weekly lets is included in the rental price. 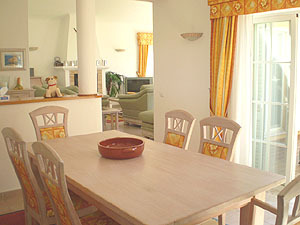 As the villa has stairs both inside and outside it is not suitable for persons with mobility problems. Supermarkets and Petrol Stations:- There is a modern supermarket and petrol station, (Intermarché) in the nearby village of Budens, and fresh bread is available there every morning. Both the supermarket and the petrol station are open seven days a week until late. Several larger supermarkets can be found in Lagos.